2.01 p.m. R4 1 Bocce (2 c Foxwedge – Whiffle, by Red Ransom) – Jake Bayliss; staged a terrific performance for third in the Karaka Million (Listed, 1200m) on 27 January at Ellerslie, and worked well in preparation for the $70,000 Matamata Slipper (Gr. 3, 1200m). With gate speed to overcome barrier nine, the right trip should see him very competitive on his home track. Fixed odds: $3.10 & $1.35. 2.39 p.m. R5 4 Ruby Armani (5 m Makfi – Trujillo, by Saint Ballado) – Jake Bayliss; drops in grade for the $25,000 Rating 75 1400 metres, after contesting the Westbury Classic (Gr. 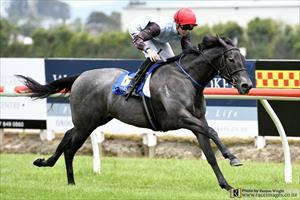 2, 1400m) on 27 January at Ellerslie. She recorded back-to-back wins prior, including the Rating 85 1400 metres on 14 January at Ellerslie, and although striking a strong field she has drawn ideally in barrier five. Fixed odds: $9.80 & $3.30.